Home/Blog/Exploring the Causeway Coast? Stay in Carnlough at Largy Coastal Apartments. Exploring Causeway Coast, stay Largy Coastal Apartments Carnlough. Lonely Planet has voted Belfast and the Causeway Coast of Northern Ireland the Best in Travel 2018. John Caddoo speaks to Gladys Smyth about Largy Coastal Apartments in Carnlough. The Destination Editor for Ireland, Britain and Iceland recently told an audience of tourism providers why Lonely Planet chose Belfast and the Causeway Coast of Northern Ireland Best in Travel 2018. Exploring Causeway Coast, stay Largy Coastal Apartments. Cliff Wilkinson said multiple people in Lonely Planet suggested Belfast and the Causeway Coast and an in-house team and panel of judges were immediately excited about it. 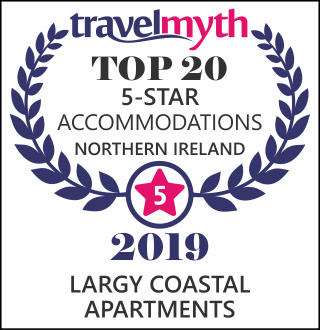 Lonely Planet chose our coast in recognition of the achievements over the last 20 years and also as a celebration of the progress made in tourism development. On the coast there is a wealth of popular places to eat and drink, activity providers and not to forget the variety of accommodation on offer from glamping sites to castles, self catering accommodation and B&Bs and much more. Carnlough is situated on the beautiful Antrim coastline. It has a picturesque harbour on the shores of Carnlough Bay and is on the Coast Road beside the North Channel and at the foot of Glencloy, the second of the nine Glens of Antrim. 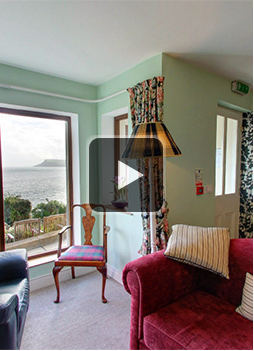 In Carnlough is Largy Coastal Apartments which, year on year, attracts tourists from around the globe. It is an ideal location for short or longer vacations. It is only 55 minutes to Belfast International Airport, George Best Belfast City Airport, 25 minutes drive to the Port of Larne where P&O Ferries dock as well as being 50 minutes to the Stena Line Belfast harbour. Latest Government statistics, released in February 2018, show that visitors to Northern Ireland are now spending £2.7 million a day. The NISRA statistics for the first nine months of 2017 show the spend by visitors to the north increased by 16 per cent to £747m. This overall growth has been put down to an increased number of visitors from Great Britain, Europe and North America in the first nine months of 2017. But, closer to home, Northern Ireland residents took more staycations and visitors from the Republic of Ireland continued to be motivated by value for money and spent £18 million more than the same period last year, an increase of 45 per cent, according to tourism bosses. People looking to explore our coastline, while enjoying the independence of staying in self catering accommodation, can look to Carnlough as a wonderful place to stay. Largy Coastal Apartments is five star rated self catering accommodation with large lounge areas and bedrooms which provide magnificent coastal views. All bedrooms are en suite with shower and bath facilities. And, if the views from the living area and bedrooms aren’t enough, Largy Coastal Apartments has a luxurious outdoor hot tub which accommodates six people. The hot tub is next to a log cabin where you can relax with breathtaking views over the coast and the North Channel. Gladys and Harold Smyth are the proud owners of Largy Coastal Apartments. Gladys said: “We love welcoming visitors to our beautiful North Coast. Our apartments will give you the perfect place to stay so you can go off and enjoy the wealth of things to do here on our Causeway Coast and Glens. “We team up with members of Live It Experience It to make sure our visitors have airport transfers, transport for touring the coast, experienced tour guides to go on walks with, know where the good places to eat and drink are as well as dipping their toes in the oceans with our water activity providers. If you are travelling this year for the International NW200, or indeed simply coming on the Lonely Planet recommendation, Carnlough is a stop worth making.